Long live fun, fast roadsters! The craze that arguably started with the exotic 1930s German machines arguably still remains with them in modern rendition – though that’s not to say that other countries are without their sleek roadsters. And never was the fun, fast, open-top philosophy more evident than in 1996, when the BMW Z3 M Roadster ripped into the motoring world in, as it were, a haze of tyre smoke. 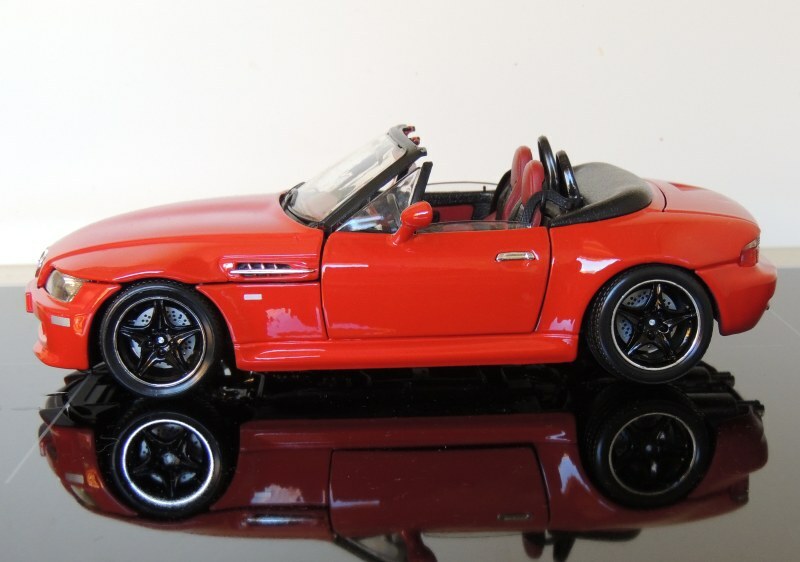 Aside from Bburago, I am not entirely sure whether other model car marques make a Z3M Roadster. It’s highly likely, because it’s a popular car in 1:1, and that more often than not translates to popularity in 1:18, and other scales. At any rate, I know that Bburago produces one, both in prebuilt, and also in pre-painted, clip-together, kit form. I was rather idle one day, and so decided to settle for the kit. It was a decision I was later to regret, as Bburago kits are generally not possessed with the aptitude of cooperation. 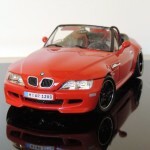 The real Z3M exterior is a triumph of sharp, sleek design, but unfortunately that is lost on Bburago’s 1:18 rendition. The panel gaps are inexcusably large, especially around the bonnet – and the doors freely swing open, without invitation. The traditional BMW trademark, the kidney grilles, are fine except for the chrome surrounds, which are a misshapen shape! This corresponded to great difficulty on my part in fitting them on the kit body. I tried every conceivable angle, discovered the only possible one, and presto! We have a bad Bburago effort. Also, the windscreen is flimsy plastic and I could, I am sure, fold it flush with the bonnet, and it would fling back like elastic. 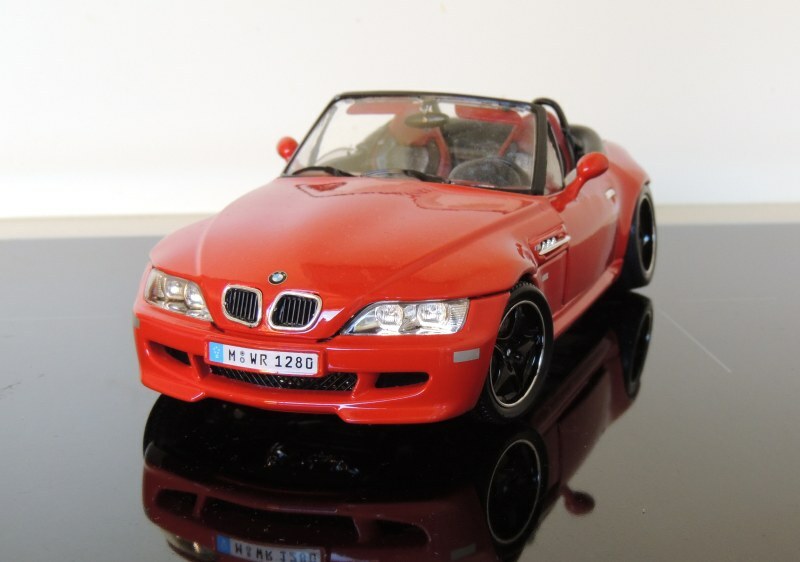 Indeed, I regret to say that the Z3M feels more like a toy and less like a model. And that’s not good. That said, I appreciate the effort with the head/tail lights, the partially closed windows, and the detail on the tonneau cover. But I could not stand the chrome rims. They were the sort of cheap, reflective chrome that one could use as a mirror, if one did not have such an unsightly face to return the gaze. 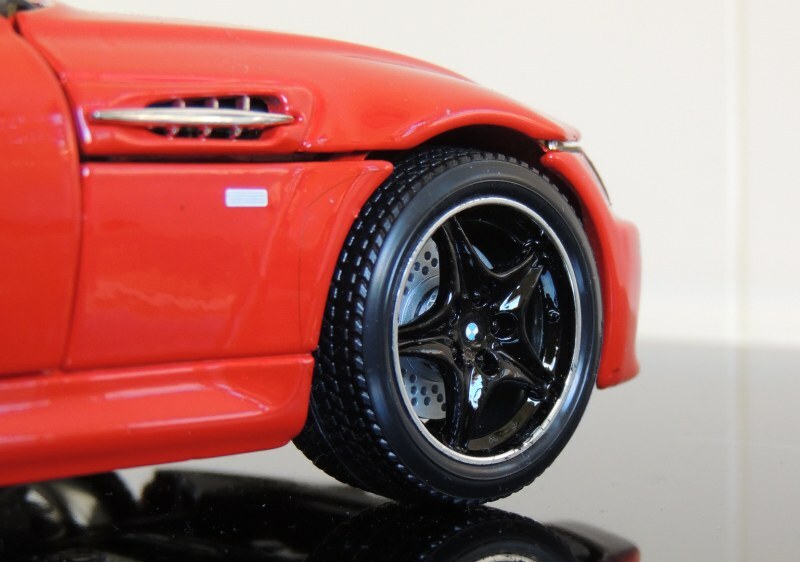 Perhaps that ’s why I bought some Tamiya black paint and transformed them into half-respectable rims, as the pictures show. They look so much better, in my opinion. As do I, in my imagination. The interior is somewhat better. Dressed in a two-tone, maroon/black scheme, the cockpit is quite attractive. Unfortunately, the instrumentation is just two big decals, but it’s realistic enough, I suppose. What’s even more realistic is the texture on all of the surfaces. They might not feel like leather, but, my word! They certainly look like it. 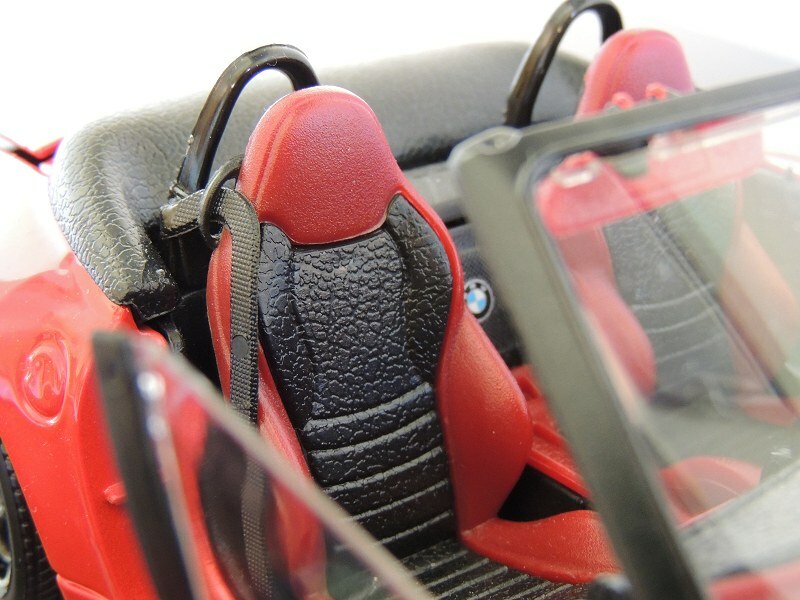 The seats are quite possibly the best seats I have ever seen on a model anywhere near this price. Bravo, bravo. Don’t let those words reverberate when I talk about the engine, however. It’s not good. We have a black plastic engine plate, and then a glitzy chrome mess on top. Bburago, stop using glitzy chrome! Especially not in engines! 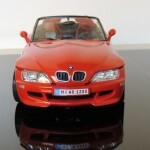 If I open the real Z3M’s bonnet, tomorrow, will I see glitzy chrome? No, I will not. Then I should not see it here. The boot is well, a boot. I have nothing to complain of in this department, but I will praise the fact that it’s nicely textured – it’s not just flat plastic like Mondo Motors would do, it’s textured. Lovely. 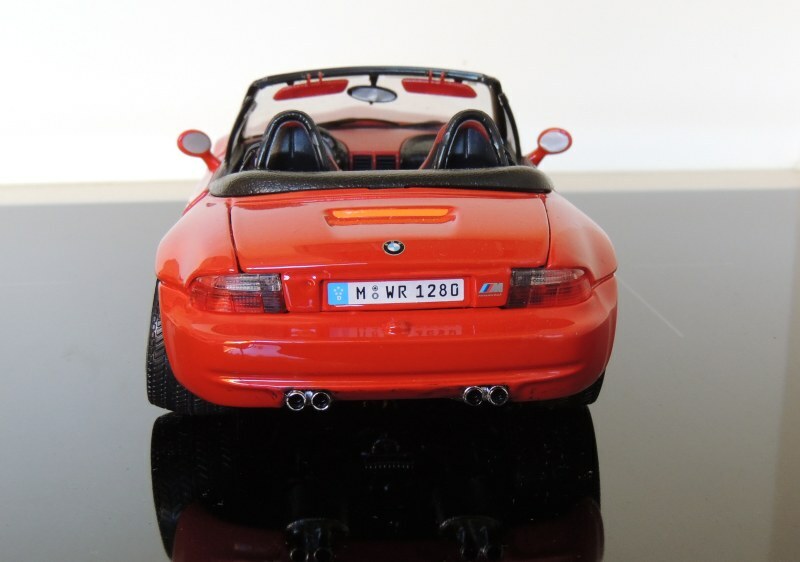 But, in conclusion, would I recommend Bburago’s BMW Z3M? No, I would not. 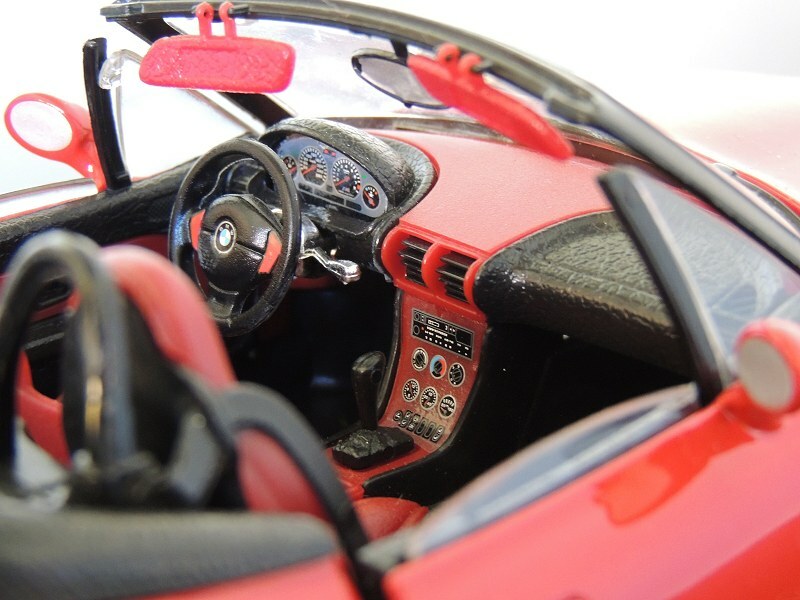 Don’t get me wrong, there are lovely points about this model, not least of which is the interior. 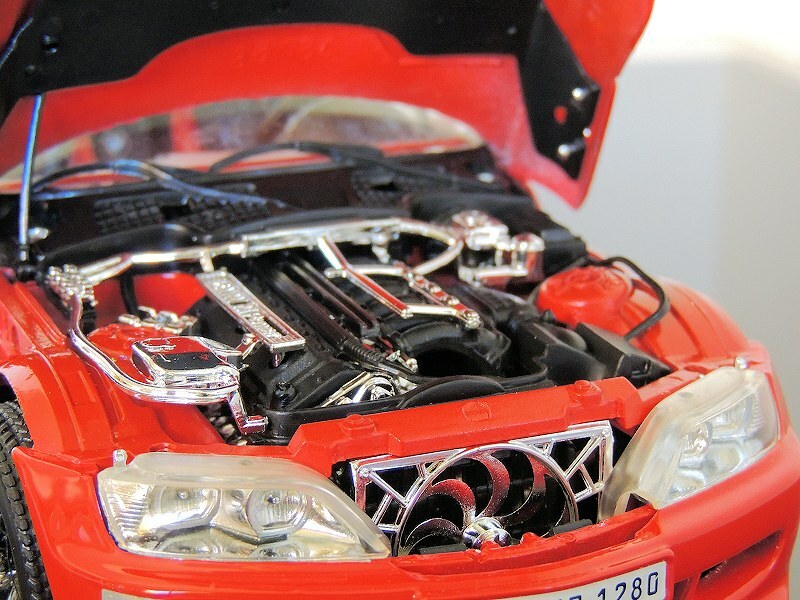 However, the overall refinement and detail is quite appalling, and I say, with regret, that it’s more worthy of the toy box than it is of the cabinet. Yet, irrationally, against my better sense, I like it. 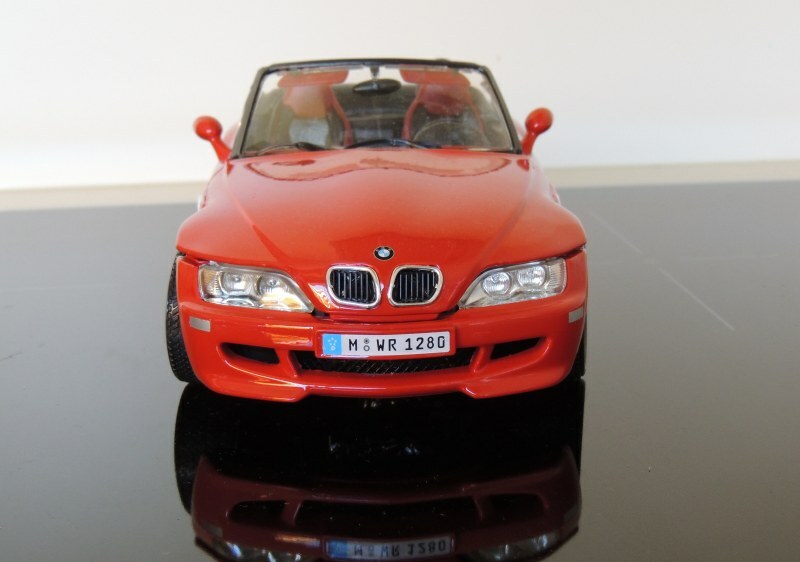 5 Responses to "REVIEW: Bburago 1996 BMW Z3M Roadster"
I drove one of these for years. I wouldn’t have recognized it. . .
With all due respect, a model like that is not even worth the effort of a review. It needs a review, in my opinion. The good should be praised and the bad shamed, so that manufacturers will know that we will not take anything other than a good effort. 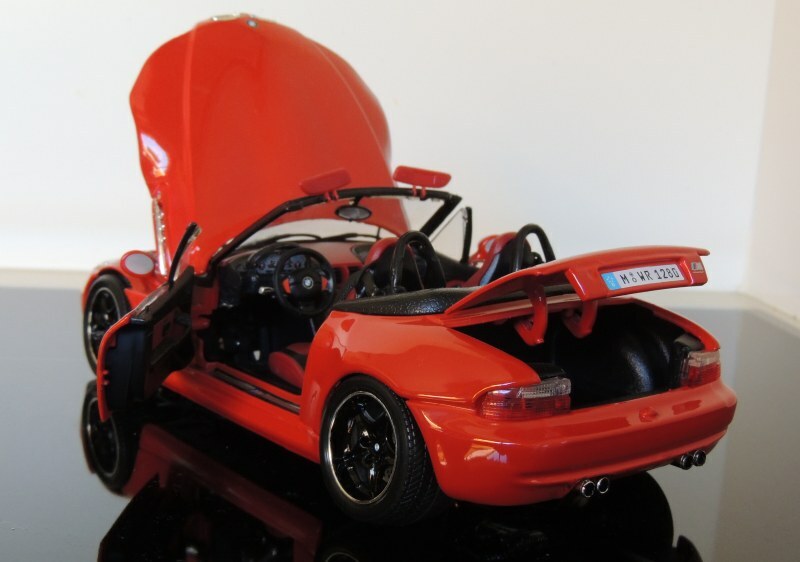 Oh, the infamous over sized 1:18 Barrago Z3M. Bought one from Costso at CDN20 (give or take) like 15 years ago and decided to throw it away as my 1:18 collection grew over the years. It just didn’t look right when displayed beside my other diecasts. Did I say the quality is rubbish like most other Burrago’s back in the days? Strange model, as I recall, it was produced in that period in two colors – blue and silver. Apparently this is a later variant. Here’s mine, with slight modifications.